Last week, my mom turned 70. Last month, my friend’s mom passed away suddenly. Last year, another’s died similarly. And a decade ago, another’s was permanently altered by an aneurysm, her speech, ability to eat, walk and interact with loved ones never to be the same again. These women are our quiet heroes. They changed our diapers and bathed us as infants, fed us chicken soup when we were sick, inspired and kept us in check as teenagers, cried at our weddings and taught us to laugh it off. They serve as sources of wisdom and comfort and knowledge throughout our lives. It doesn’t seem right that they age and die – mothers should be perpetual, permanent, impervious to harm, always there for us. Though she moves a bit more slowly and snores a bit more loudly than she used to, mine is doing well. I am more grateful for and aware of this than ever, in light of others’ recent losses. And more attuned to the reality that I am now stepping into her shoes. Tonight begins Christmas. My first as a mother. My first as someone’s go-to, food source and place of warmth. And my first on the other side of the holiday. I can’t help but feel the transition from childhood excitement and anticipation of what Santa may bring to prep, planning, listmaking, wrapping, shopping, wrapping, shopping and creating. Delivering on a dream. Making magic happen for someone else. Though this evolution started long ago – it’s been some time since I was a kid racing out to the tree on Christmas morning – creating a member of a new generation somehow makes it feel more official. And I want it to be perfect for my daughter. Perfectly fairy-light twinkly, perfectly beyond imagination, perfectly Christmasy. But what does that really mean? How do I know I’m doing a good job of it? In the midst of feeling overwhelmed about the seemingly constant “oh-it’s-her-first-Christmas-aren’t-you-so-excited-it-will-be-so-special-and-magical-aren’t-you-sooooo-excited-what-will-you-do” sentiments, I am aware of the more important reality: I am now responsible for the care and education and character shaping of another human being who will be changing each day, growing physically and mentally, relying on me for food and clothing and warmth and smiles and love and inspiration. I will play a role in shaping memories in a new way. And it’s completely uncertain how I’ll do. Even with something as simple as creating holiday magic. Every December I begin a holiday baking flurry with a batch of my mom’s Christmas toffee. She’s been making it for more than 50 years – I almost choked when I realized that number just now – since she was in college, gifting friends with it because it was an affordable gesture. It’s delicious, perfectly buttery and sweet and salty and chocolatey and toothsome. I eat it for breakfast and after-dinner dessert, and mid-day whenever. I remember when my mother taught me how to make it – I was in elementary school and stood over the heavy-bottomed sauce pot, stirring and stirring and stirring with that wooden spoon. Coaxing down the roiling, golden butter-sugar mixture to keep it from climbing over the lip of the pan, waiting patiently, stirring, stirring, for the mixture to turn a deep golden brown – but quick, not too brown! – so I could alert my mother to pull it off the stove and pour it rapidly onto the waiting cookie sheet, tipping and tilting the sheet to stretch the toffee-to-be, and let it begin to harden before another swift movement – a scatter of a handful of chocolate chips across the surface, wait a minute for them to begin to melt before spreading into a smooth, rich sheen, and then a final scatter of chopped walnuts. To the fridge to harden before breaking into shards, sampling a few bits for quality control, and arrange on plates for friends and family. Someday in the not-too-distant future, I will teach my own daughter how to make this toffee, aware of the heat and the passing on of a recipe in a new way. We will use my grandmother’s defunct pressure cooker – the one time I pull it out of the cupboard each year, seemingly destined for this use. I will think of her, long since passed on, and my own mother, and all the mothers who taught their children the secret to a special holiday treat, while they passed down countless lessons of life. In honor of our mothers (and equally but differently significant fathers, and siblings, and other loved ones), Merry Christmas. Melt butter (if unsalted, add a pinch of salt) and sugar together over medium-high heat in heavy-bottomed sauce pot, stirring constantly until mixture thickens and turns a golden brown. Pour immediately (and carefully) onto lipped medium-sized cookie sheet or jelly roll pan. Let sit for a minute or so to begin to harden. Sprinkle chocolate chips evenly across surface of toffee; let sit another minute to begin to melt. Using an offset spatular or butter knife, spread chocolate evenly over toffee. Sprinkle chopped nuts across surface of chocolate. Move sheet to fridge to enable toffee to harden, over a period of a few hours. Once hardened, break toffee into shards and serve. Keeps for weeks in fridge. I loved reading your heart warming note. It brought both smiles and tears. Thank you for making this holiday even more special by sharing your Christmas memories and toffee recipe. Merry Christmas Laura! Thank you, Carol – I’m so glad. Merry Christmas to you, too! What a lovely post, Laura! This is Shannin’s college friend, Annie. Mama Stein directed me here – how fun to see your blog! 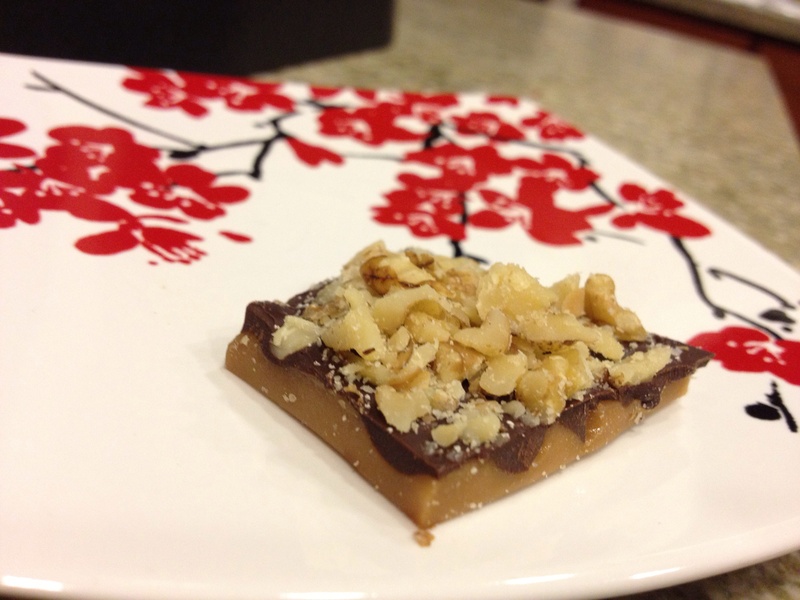 The toffee reminds me of one that we make, but ours has saltine crackers on the bottom. That stuff is like crack – morning, noon, and night for me as well. 🙂 Merry Christmas to you and yours! Thanks, Annie – and hi! Love your blog as well. I’ll have to follow. And mmmm, saltines and sugar, excellent combo.